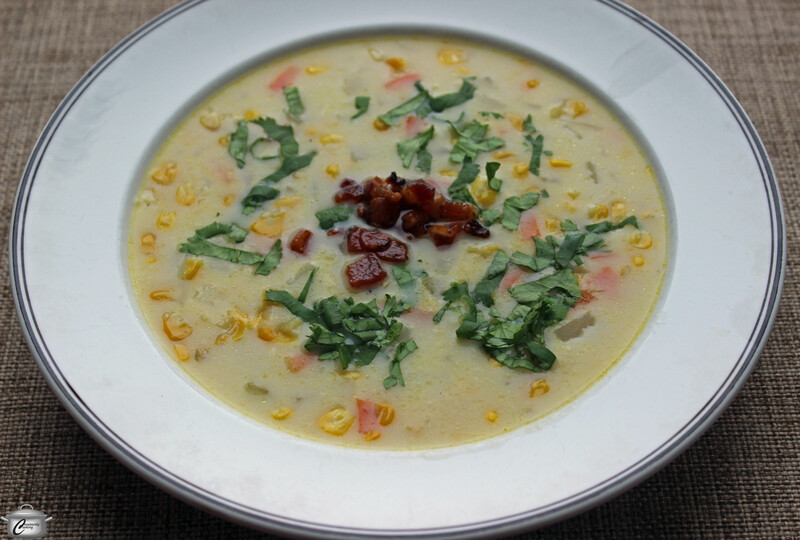 I grew up eating corn chowder and while I always liked it, I never loved it. The other day I was thinking about ways to improve the standard, basic, somewhat pedestrian corn chowder recipe. In summertime, I’d most certainly grill up cobs of fresh sweet corn and add their smoky goodness to the pot. For wintertime, I decided to try adding extra flavour via my husband’s favourite smokey garnish – bacon! While this simple chowder is certainly tasty on its own, the addition of lardons of double-smoked bacon, fresh cilantro and lime juice take it from delicious to dazzling. You can easily make it up to three days before serving; just be sure to reheat it gently without boiling. 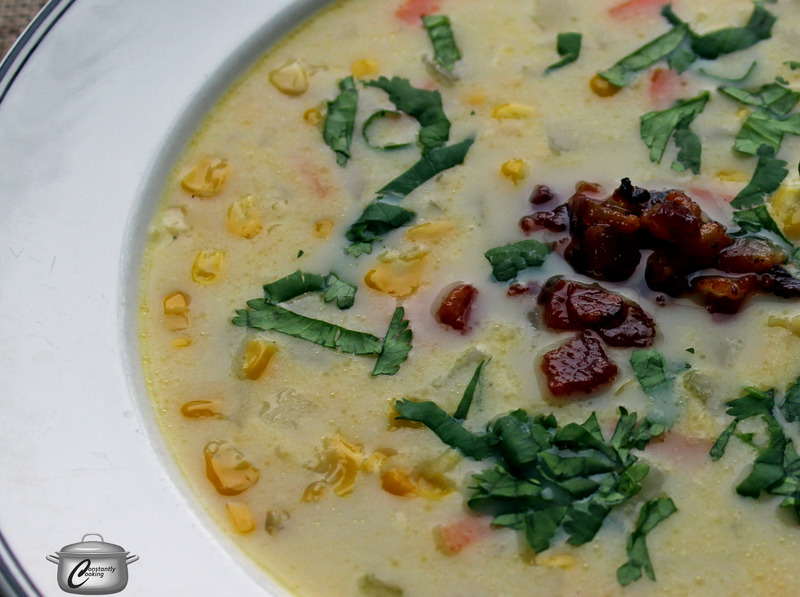 Classic corn chowder gets a tasty makeover with the addition of bacon, cilantro and lime. Add onion and sauté for 2 minutes. Add celery and carrots and sauté for 5 more minutes, stirring often. While vegetables are cooking, dice bacon and put in a medium skillet. Cook over medium to medium-low heat until crispy; 10 – 15 minutes. When cooked, drain bacon lardons on paper towel and set aside. When onions, carrots and celery are tender, add chicken stock and diced potato to the soup pot. Stir and increase heat so it comes to a gentle boil. Cover pot; reduce heat and simmer for about ten minutes, until potatoes are just tender when pierced with the tip of a sharp knife. When potatoes are just tender, add canned and frozen corn. Simmer for 5 minutes. Add milk and cream and heat the chowder until it is just about to come to a boil (do not let it boil). Reduce heat to minimum; taste and add salt and pepper as needed. To serve, ladle hot chowder into warmed bowls. Garnish with bacon and cilantro. Serve each bowl with a wedge of lime, to be squeezed over top. This entry was posted in One dish meals, Soups and stews and tagged bacon, brunch, carrots, celery, chicken broth, chowder, cilantro, corn, cream, creamed corn, double-smoked bacon, frozen corn, lardons, lime juice, lunch, milk, onions, potatoes, soup. Bookmark the permalink. I love the fact that you make so many soups; soups are the perfect winter foods. I agree – and it sure has been a winter when a LOT of soup has been necessary!